Facilities: FCI Phoenix with an adjacent minimum security satellite prison camp. 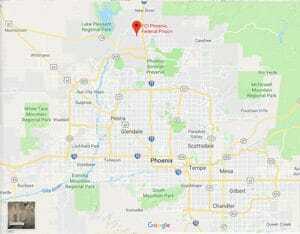 Location: FCI Phoenix is located 30 miles north of downtown Phoenix, off I-17, Pioneer Road exit. Background: FCI Phoenix was opened in 1985. It contains a jail unit which houses holdover inmates. The camp was opened in 1989. It is located adjacent to, and provides support services for, FCI Phoenix. Notable inmates include former drummer for Steppenwolf Jerry Posin (released in 2009 after serving 5 years). Housing: Inmates are housed in two, and three-person cells. There are a total of four housing units. Inmates at the camp are housed in dormitories divided into two-person cubicles. Health Services: FCI Phoenix provides medical and dental sick call, emergency care, eye care, physical examinations, and medications. Emergency medical care is available 24 hours a day. Inmates are assigned to a primary care provider who treats them for the duration of their stay. Psychology Services: Intake screening, individual psychotherapy, group psychotherapy, personal development groups, and crisis intervention are offered to inmates. Regular groups include criminal thinking, anger management, and others. Residential Drug Abuse Program (RDAP): Both FCI Phoenix and the camp house a Residential Drug Abuse Program (RDAP). Both facilities also offer a Drug Education class, the Non-Residential Drug Abuse Program (NR-DAP), and Alcoholics Anonymous (AA). Education Services: FCI Phoenix provides pre-GED, GED (English and Spanish), and English-as-a-Second Language (ESL) programs. Inmates who successfully complete the GED and ESL programs, and who pass the GED and CASAS Certification exams respectively, are awarded a financial incentive award (usually $25.00). Adult Continuing Education (ACE) and parenting courses are also available to the inmate population. High school diplomas and post-secondary programs are available through paid correspondence programs. Advanced Occupational Education: FCI Phoenix offers advanced occupational education in Principles of Construction. The camp does not offer any advanced occupational education programs. Vocational Training: Both FCI Phoenix and the camp offer vocational training in Carpentry. The main prison also offers vocational training in Electrical, Plumbing, and ServSafe. Apprenticeship: FCI Phoenix and the camp offer apprenticeships in Cooking, Electrical, Electronics Tester, Electronics Utility Worker, HVAC, Landscape Tech, Plumbing, Quality Control, and Recreation Assistant. The camp also offers apprenticeships in Front-End Mechanic. Library Services: A law and leisure library is available to inmates. The TRULINCS Electronic Law Library contains case law from the federal districts, circuits, and U.S. Supreme Court for reference during the library hours of operation. FCI Phoenix maintains a leisure library with a great variety of books including reference and general interest. The leisure library also participates in an interlibrary loan program with the City of Phoenix Public Library. UNICOR: The FCI Phoenix UNICOR facility produces electronics and plastics. The camp does not house a UNICOR facility. Commissary: Upon arrival, inmates are given commissary cards. Inmate commissary/ID cards must be in possession of the inmate at all times when out of their housing unit. A spending limit of $360.00 per month is imposed. Postage stamps, some over-the-counter medicine, copy cards, funds transferred to ITS (phone credits), and TRULINCS account unit purchases (inmate email) are exempt from the spending limit. Inmates may only shop on their designated shopping day each week. Recreation Services: Indoor and outdoor recreational activities are available at FCI Phoenix. A comprehensive program of sports activities including varsity and intramural teams are available for inmate participation. There are leagues for basketball, soccer, and softball which incorporate varsity, intramural, and over-35 teams. Tournaments are held on a regular basis in addition to the normal end-of-season tournaments for league playoffs and championships. Weight lifting, walking/running, and stationary bicycles are also available. Hobbycraft activities are also available in both facilities. The main prison also has a music room.